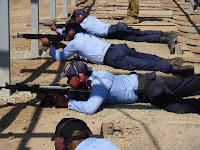 East Timor Legal News 19 July 2012 Source: Independente - The Executive Director of Fundasaun Mahein, Nelson Belo, said the Timorese National Police (PNTL) should not use guns to respond to any problems because the security law banned them from using weapons in resolving the problems. Belo said the police should deploy three types of methods for responding to problems; the intelligence service, community policing and rapid intervention by the special police to respond based on the existing law, but not to kill people. He added that the PNTL commander and the Secretary of State for Security should be responsible for the death of the late Armindo Pereira Alves in Hera based on the security law existing in the country. Meanwhile, the daily Diario reports that the Director of the Human Rights Association (HAK), Rogerio Viegas Vicente, has strongly condemned the recent violence following the national conference of the CNRT party. “We condemn acts of crime in this country because acts of violence are violation of the law” he said. Mr. Viegas also called on political parties’ leaders, the youth and the communities to be committed to creating peace, unity, and stability to better develop this country.